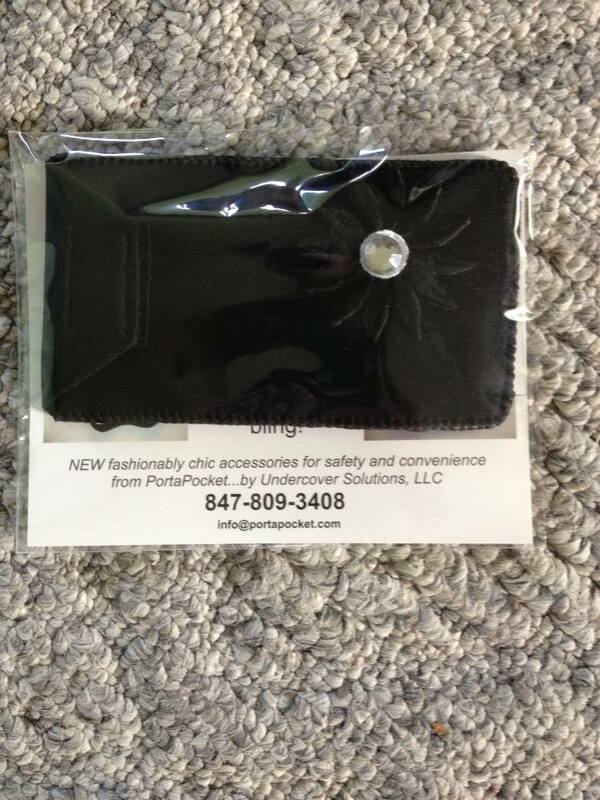 Thank you to PortaPocket for providing me with a sample, free of charge, for review. These are my own honest opinions. I have a purse. I like my purse. However, there are just some times where it’s not convenient or even practical to carry my purse. I also know that there are some people out there who don’t care for purses. 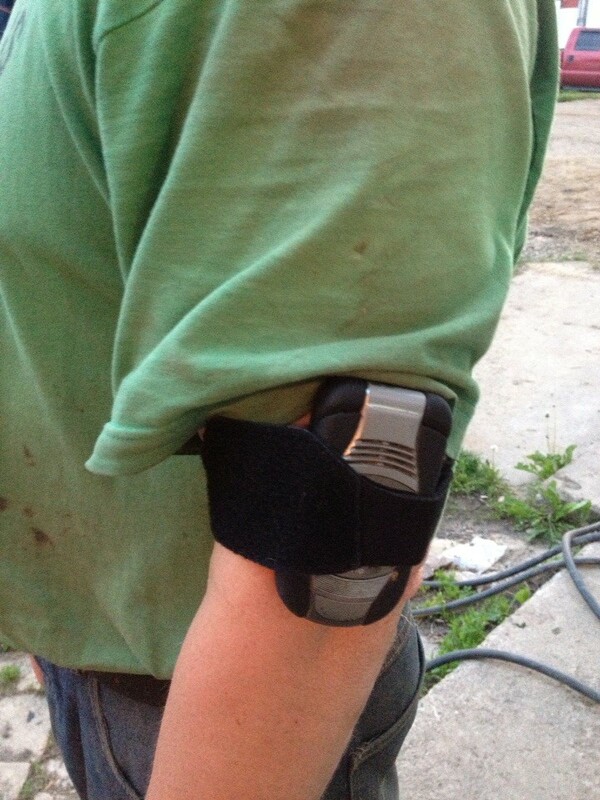 That is where PortaPocket by Undercover Solutions LLC can come in handy. The PortaPocket is a product that becomes a “pocket” for you. There are many times when clothes just don’t take into account the fact that some of us need to carry things with us. I have a couple pairs of pants that have pockets about 2 inches deep or skirts that have no pockets and it drives me crazy when I have no choice but to drag my purse along everywhere. Not to mention, when I cut grass, I typically hold my phone between my legs the entire time because I have nowhere else to safely put it where I will have a chance at hearing or feeling it ring. We have a big lawn and it takes about 1 1/2 hours to cut the entire thing. I strapped my phone into my PortaPocket on my arm and got busy cutting. My iPhone wouldn’t fit into the pocket I received so I just strapped it straight into the “wrap” part and I was able to cut the whole lawn without my phone budging. Not only that, but I even felt my phone vibrate a couple times when messages came through. Since I’m the main lawn mower, I’m excited that I have a safe place for my phone during this job each week. Since I use my iPhone for photos, I took a photo of my husband with his phone to show you how I used my PortaPocket during lawn mowing. 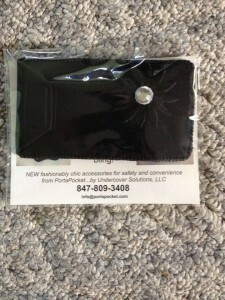 The bling style medium pocket that I received is belt loop mounted and very secure. The small pocket is velcro mounted but is also very secure. I do prefer the belt loop mount and would love if they would have that option on all their pockets as I tend to wonder if the velcro on the small pocket will eventually wear out after years of use. It would definitely take years, though, as the velcro is very strong. 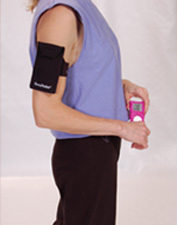 The PortaPocket Essentials comes with an 18″ belt and a small velcro style detachable pocket. This small pocket is the perfect size for credit cards, drivers license, or cash. 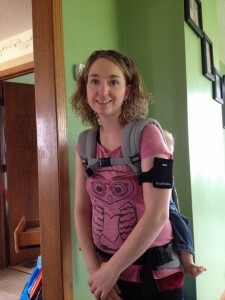 I like that you can attach the belt to your arm, ankle, calf, or possibly even thigh. I remember when I used to be so desperate that I’d even put cash in my sock just to not have to carry a purse. Not very convenient. No pockets are no longer a problem with the PortaPocket. I also like that PortaPocket also sells different sized straps, including a waist belt, as well as multiple sized pockets. They even have pockets that have bling on them. They seem to have something that will fit any situation. You can connect with PortaPocket on Facebook and Twitter. 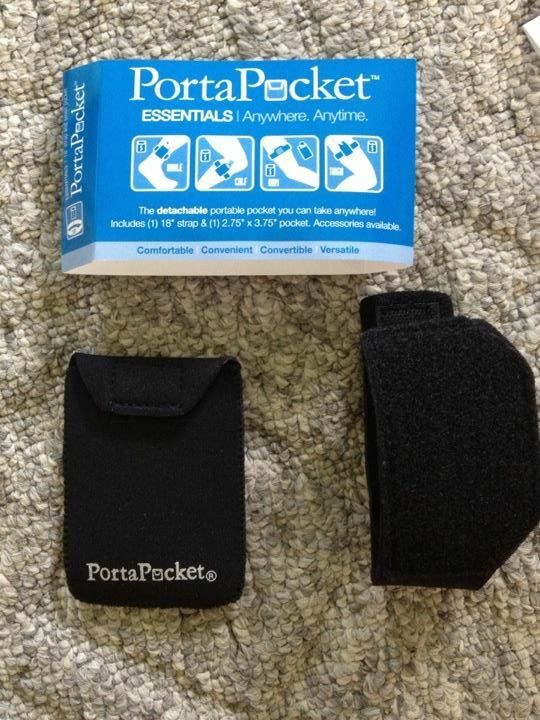 One lucky Emily Reviews reader will win their own PortaPocket Essential kit. Giveaway is open to the US and will end on June 28, 2013. Just a quick note to all you iPhone owners… the PortaPocket Medium pocket will nicely fit your iPhone provide you don’t also have a thicker style sleeve on the phone as well (in which case the Large pocket will almost certainly work…we had not sent Miranda that particular size). I have an iPhone4 and use it in a Med PortaPocket pocket every day. The iPhone 5 will also fit, again, as long as it doesn’t also have a sleeve on it prior to you inserting it into the pocket. Good luck to everyone entering and please don’t hesitate to contact me if you have any questions. We’re here to help you. I have been looking for an alternative to carrying a purse lately so this is perfect timing for me to have found this giveaway post. I love these products. Thanks for the giveaway opportunity.